B&O Beolit 12 review | What Hi-Fi? 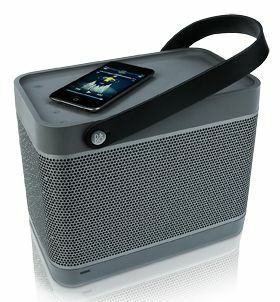 Well, this is a first – an AirPlay-enabled picnic basket in the shape of the Bang & Olufsen Beolit 12. And by ‘picnic basket’, we mean, of course, £600-worth of lovely-looking, impeccably built speaker dock. It’s hard to overstate that last point. From the capacitive control buttons on the top, to the beautifully machined grille, the neat cable-management system and the quirky carry-handle, the 120W Beolit 12 is probably the classiest system we’ve seen. It’s portable too, with the internal rechargeable battery good for around eight hours via a wired (3.5mm jack or USB) connection and four with AirPlay. We dived straight in with the excellently produced Metallica (the black one), and were immediately impressed by the Beolit’s dynamic abilities. As Enter Sandman changes gears from the acoustic intro, through the drum crescendo and then puts its foot to the floor, the sound is never anything less than controlled. There’s good separation between instruments on offer too, as Justin Adams and Juldeh Camara’s complicated Kele Kele proves. Vocals ring through clearly, on top of all the layered parts beneath.There’s warmth here, but it isn’t at the total expense of punch or timing: leading edges of notes are as crisp as you like, and the sparkling treble of cymbals rings is delivered sweetly. The Beolit certainly isn’t clinical or buttoned-up. But for all that, the Beolit 12 just doesn’t make us grin. Clear though its presentation might be, and up to eleven its volume might go, there’s a restrained quality to everything we play through it. Everything is precise, everything is competent, but we just didn’t get a sense of fun – odd, given the system’s looks. It’s better via USB, but still, for this money we expect a little more spice in our basket.